Beaders all over are creating their own spiral seed bead patterns. It is great fun to look at other people's work and admire their results, and then to imagine what new spiral seed bead patterns you can create yourself. Let's take a look at some of the factors you can play with as you do spiral ropes. I make most of my spiral ropes with size 6 or 8 seed beads as the basic element. I have made one or two with size 11, but I don't find them commercially viable as they take much longer to make but customers are unwilling to pay more for them. So anytime you see me doing a spiral rope in beads smaller than size 8 you can assume it is to be a gift for someone I really care about (and you can have good odds that it is only going to be bracelet length). 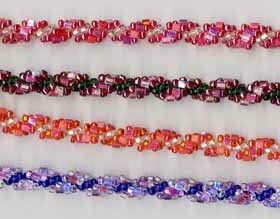 I recently saw a project in one of the bead magazines that included a length of spiral rope with size 15 beads. Not my thing, but if you want to fit hours of beading into a very small box then size 15 beads would be a good way to go! Graduated sizes in the outside beads create an interesting effect. If you use large beads in the center of the outside beads, smaller beads on the end put the emphasis on the larger center beads. On the down side, the smaller beads at the end provide a little less coverage of the core beads; if there is not a huge contrast between these smaller beads and the core beads, the lesser coverage may not be noticeable. 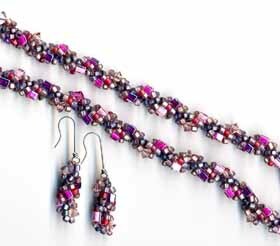 Instead of a simple repeat of adding one core bead in Color A followed by three outside beads in color B, or 3 outside beads in colors B-C-B or B-C-D, you can have a number of combinations that you use for the outside beads. 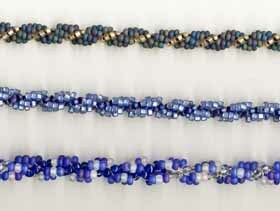 The necklaces shown here all have outside beads in the same bead type for each repeat (rocaille-cube-rocaille) but the spiral seed bead patterns vary the colors of the cubes, working through an assortment of related colors. Some of the patterns also vary the colors of the rocailles. The flat surfaces of the cube beads add flashes of reflectivity that make these necklaces seem to glow a bit. 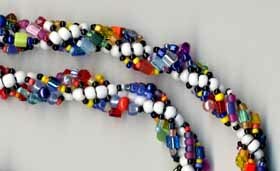 This necklace, mostly size 8 beads, includes an assortment of small beads in the outside beads. This is a fairly randomized mix in which I just tried not to place identical elements next to each other. When I couldn't find the right beads to make headpin-style earrings to go with this necklace, I made small sections of spiral rope and sewed them onto earwires that had wrapped loops to hold the thread secure. In this necklace, white beads form the core and size 11 black beads provide punctuation at each end of every row of outside beads. The color mix is bright and cheerful, and the mix of bead types is pretty wide. I had some trouble keeping the outside rows as even in length as I might have wanted, but this is probably my most-worn single necklace. I love to travel with it because it goes with so many of my clothes. Probably the most obvious thing in a spiral seed bead pattern is the contrast between the core beads and the outside beads. When the finish on the beads in the core is different than the beads on the outside of the spiral, it seems to make the rope pattern pop out nicely. 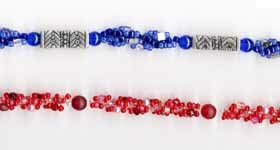 The top example here uses silver-lined matte beads for the core and (not lined) matte beads for the outside. The second uses matte silver-lined beads on the outside with plain matte beads for the core. The bottom necklace in this picture uses transparent beads for the core and and assortment of matte beads from a packaged mix for the outside. This was one of my early spiral ropes and I tried alternating sections of clear beads and transparent blue beads for the core. It is not a great effect, but it isn't the worst experiment I ever tried. . . . The red necklace on the bottom was one of my earlier efforts, before I had learned to really stretch my thread. You can see how the thread has stretched. In addition to that mistake, I only went through each accent bead once. In retrospect, I should have circled around through the spiral sections to reinforce the areas that support the accent beads. The blue necklace on the top features two sterling silver beads by M'lou Brubaker (my silversmith sister). M'lou warned me that there might be sharp edges inside the silver beads, so I have kept the thread away from the interior of each metal bead by surrounding the bead with round blue beads that nestle a bit into the metal opening. Having learned from my mistakes on the red necklace, I did a much better job of reinforcing the area around and through the accent beads. My mother, who was notoriously hard on jewelry, wore this one for quite number of years and everything has stayed tight. Using beads with holes near their edges, such as magatamas, lentils, or other drop-type beads in the outside bead sequence creates additional 3-D effects. You might want to experiment with spiral seed bead patterns that use a single drop or magatama in the center of the outside bead sequence to create a third level of elevation with their own spiral up the rope. Or you could try using lentil beads for all the outside beads, or alternate lentils and seed beads. The more you play around with spiral ropes, the more possiblities seem to pop into your mind, so have some fun!